KIDNEY disorders can be well treated by Ayurveda and ayush treatment in combination and integrated ways. Kidney is a very sensitive and important organ of human body. The most common problem is CALCULI / STONE, which can be placed in nay part of the kidney or ureters or urinary bladder. This causes Hydronephrosis and thus most of the sufferers have high Blood pressure problems or kidney pain or mental disorders or insomnia sleeplessness and many other physical disorders like loss of appetite, indigestion and so on. AYURVEDA and AYUSH Combination and integrated treatment and life style management promises sure cure of the stone problem. Si is of the other disorders of Kidney like Nephritis, Albuminuria, Ketonuria, Bloody Urine , Infection of Kidney and many disorders. An E.T.G. AyurvedaScan including Ayurveda Blood and Urine examination bases Ayurveda and Ayush treatment assures the cure of the KIDNEY problems. Leucoderma is a skin pigment disorder, which is a complex disorders, unknown to the medical scientists, how it happens and why it is not curable in view of modern medical system. In fact , the melanin, a kind of pigment of hair and skin, formation in human body is depend on some physiological process chain products, which Tyrosine produces. Melanin is a complex polymers in which a major constituents is formed from tyrosine via ”dihydroxy phenyl alanine” , sayDOPA. The formation of melanins from tyrosine is occurs due to the action of polyphenol oxidases or tyrosinases. Tyrosinases is a metal containing mixed oxidase, which carries in a sequence. An interesting facts came out that melanin forms a reversible oxidation – reduction system, in which the reduced form is tan and the oxidized form is black. Melanines appear in tissues as regular , spheroid granules and represent formed elements rather than precipitated aggregates. Melanins are produced in pigment forming cells, the melanocytes and their formation is stimulated by adrenal cortex and specially pituitary hormones. In Ayurveda, the treatment of Leucoderma is successful on the line of the findings of the E.T.G. AyurvedaScan and Ayurveda Blood serum examination and other tests , done at our clinic outdoor hospital. A full E.T.G. Ayurvedascan R.P.1 and and E.T.G.AyurvedaScan W.P. 1 and ETG AyurvedaScan SP-1 with Ayurveda Blood serum and Ayurveda Urine test obtained reports and data provides opportunity to study and scrutiny of patient’s body hidden problems. In Leucoderma patient, complex human body systems are involved and responsible to produce disease. A fair treatment of all the involved systems are necessary for treating this disorder. The cure is possible, if treatment covers the complexity of the individual patient problem solution at a time and simultaneously. To find out the exact reason and genesis of disorders, is not a easy task and it consumes time. It takes four to six hours to complete the task. After that a complete picture of the genesis of leucoderma can be draw out. Most difficult task is with the prescription given to patient which is depend on the classification of Ayurveda principles and management accordingly. The patient is some times suggested Ayurveda and Homoeopathy and Unani and Allopathy remedies simultaneously adjusting remedies natures and their actions on disease control. Above mentioned phenomenon is applied in whole skin and hairs relations of hyman beings , but apart from this condition this factor is not applicable there, where white patches are seen and discolored patched creates problems. White patches problem is differ from the melanin in buffer. Small patches on whole body or in a part of body or scattered patches , all have their different different phenomenon of disorders. All have dissimilarity in their origin and are not accepted in generalization. This disease is an individual disorder and thus the treatment should be done in the individual to individual ways and not in general way. Leucoerma disease is not a simple disorder as it is understood by the patient. This is a very complex and fast raising and spreading disorder. Finding the exact reasons of the disorder and treating the cause/causes are the only way for treatment and control. 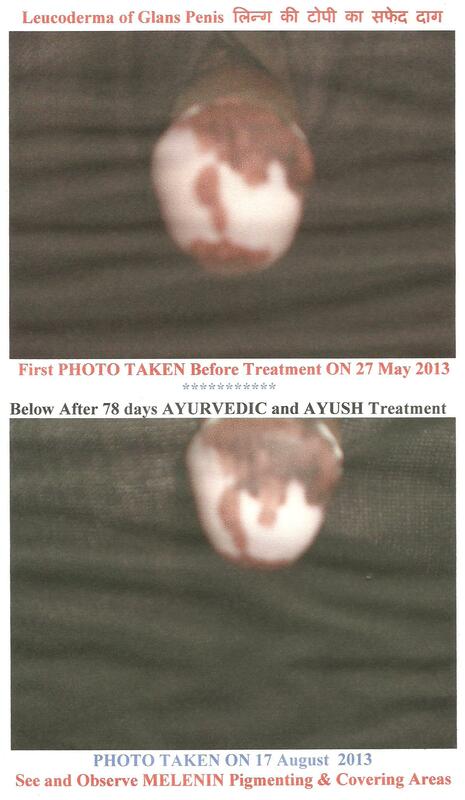 This is not an easy job and treatment should be taken by the patient by expert Ayurveda Doctor. Early detected Leucoderma cases responds by the treatment soon and can be covered possibly 4 to 8 months or few more months. Maltreated and old cases takes almost 6 to one year and this given period could expand more. Patient hides their habits and disease suffering period to physician and tell a lie. Patient are not very clear to physician that what they have done treatment and used which types of remedies both internal and external. Some takes intoxication, some takes remedies, some takes alcohol and etc etc. Lastly one point is very necessary for patient that this is not a simple disorder. Leucoderma heals slowly and gradually and some time speed of cure is very very slow. In observation it is seen that ones Leucoderma patches are starting their coloring process, either it is slow are fast , it is promised that the disease will certain cure, not including time limit.